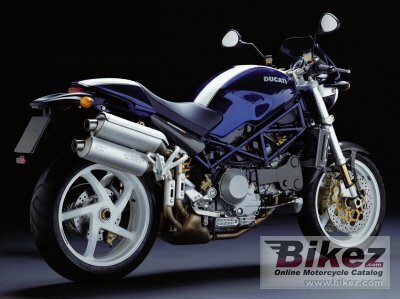 2004 Ducati Monster S4 R. Picture credits - Ducati. Submit more pictures. Comments: The S4R is the top of the range Monster - the most powerful, highest-performance Monster ever. It all starts with the 996 cc Superbike engine and lightweight Superbike-derived trellis frame to ensure the perfect combination of power and handling. A Showa fully-adjustable front fork with low friction TiN treatment and a fully-adjustable Showa rear shock handle suspension duties. Ask questions Join the 04 Ducati Monster S4 R discussion group or the general Ducati discussion group. Bikez has discussion forums for every bike. View comments, questions and answers at the 2004 Ducati Monster S4 R discussion group. You can sign up for e-mail notifications when other riders answer you. If you have extensive experience with the MC, please send us a review. If you consider buying this bike, you should view the list of related motorbikes Look at photos. Compare technical specs. And check out the rating of the bike's engine performance, reliability, repair costs, etc. You can compare the rating with other bikes.